I am indebted to David Whyte introducing me to the root meaning of the word ‘genius’ from its original meaning the spirit of place. I’ve been doing a little research on the word and the Oxford English Dictionary has added to my understanding: the word usually meant ‘the tutelary god or attendant spirit allotted to every person at his birth, to govern his fortunes and determine his character, and finally conduct him out of the world.” It seems to me this is very much like the notion of ‘name of grace’ that is part of the spiritual quest to understand your true vocation in the eyes of God. 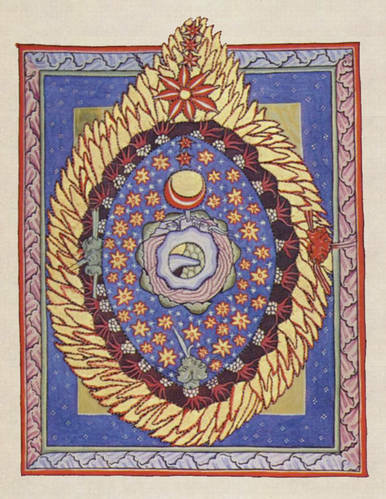 Hildegard was and continues to be a genius in every sense of the word; but so too are each and everyone of us a genius with the capacity to inspire by being our whole selves and fully embracing all the gifts and talents God given and destined to be shared with the world. Hildegard I think you admonish us often for not fully embracing, celebrating and sharing full selves. Here is one of your visions that comes to mind (Book 1 The Ways of the Lord: (God) has armed every person with intellect, commanding him to be active and vigilant in the exercise of virtue and rid himself of perverseness and negligence (The Ways of the Lord tr Mother Columba Hart & Jane Bishop, Harper One p26, 2005). I often find myself envious of those who know at an early age their genius and I love to watch a child grow into adulthood and see the seeds sown come into harvest. The child with her head in a book everyday and sometimes all day becoming a writer and researcher, the child who cries when he can’t play his guitar anymore and tells me in adult life if he can’t play he can’t breathe, the child who looks under every rock and checks out all the bugs finishing his environment degree and building his own garden, the child who is ill and tests out most health practitioners becoming an expert in nutrition. The genius of every person is a part of the intelligence of this universe. Universe means one word – we are all the one word of God and we all have our own individual word to bring to this whole story and it is our individual word which is required. Take up your genius, find your name of grace and for God’s sake do something. This entry was posted in Uncategorized and tagged David Whyte, genius, Hildegard, sufi, universe on January 5, 2013 by Moira Were AM. Thank you Jessica, I am glad you are enjoying what I write. I appreciate you taking the time to let me know. This is an inspirational message as it refers to the ‘higher being’ present in each of us. That we don’t need to rely on organizations or religions…it is in us to make positive change. Good for anyone questioning their purpose or looking for motivation. This is also an encouraging message, as we are born with this gift of God. During our course of life the genius that we posses may be hidden, we can always discover what talents we potentially have at any stage of our life, to accomplish our mission God has assigned to every one of us. Many thanks Alizar! Hope all is well with you and your family.